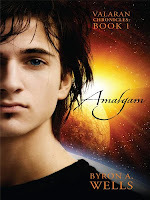 Ana Mardoll's Ramblings: Author Interview: Byron Wells on "Amalgam"
Ana: Today we have Byron Wells introducing their book, Amalgam, The Valaran Chronicles: Book 1. I haven't read this book myself, but Byron was kind enough to agree to guest blog about their book to any readers who might be interested in the subject. Byron, how would you describe your book to your prospective readers? In broad terms, what is your book about? Byron: My book follows a young man named Hobs, who through a tragic accident meets Archon, a relic of the Valaran Empire. Everything he believes is challenged as a result of this encounter and he must rise above who he was to save his planet. Byron: The book covers a wide range of conflicts, one of which is bullying - which every young adult can relate to in one form or another. Another theme is challenging who you are, and willingness to learn new things. Finally, we take a look at how Hobs manages anger in the face of critical challenges. Byron: My favorite authors would include JRR Tolkien, Anne McCaffrey and Tom Clancey. While not directly an influence on my book, they fueled my love of reading. This book is the product of 8 years of reviewing over and over in my mind; it reached the point where I finally had to commit it to paper, and I am glad I did. Byron: Wow, this is a tough question since I want my story to be unique and different...there could be flavors of matrix, and yes I know that is not a book, but is true. I love Ann McCaffrey, so the low-tech nature of my story may come from her writings. Byron: This is my debut novel, and I have two more to follow. Byron: My book is available in paperback and all major resellers (i.e., Barnes and Nobles, Chapters, Indigo, etc.). It is also available on Kindle and from Smashwords. Within the next few weeks you will also be able to get it from Kobo, Nook and iBooks. They can also purchase the eBook (pdf, epub or mobi) from me directly using my website.